J.Kaus asks: Why are Grandfather clocks called Grandfather clocks? At first glance, the answer seems obvious. Think about it- when was the last time you saw a grandfather clock in the house of anyone under the age of 70? Grandfather clocks- with their long cases, pendulums, echoing chimes, and Roman numerals- seem to belong to the world of courting parlors, Model-T Fords, silent movies, and going out on a date for an ice cream soda. In short, the world of grandparents. Yes, this may seem logical and obvious, but the real reason these timekeeping devices (technically called “Longcase clocks”) picked up the grandfatherly nickname has nothing to do with grandparents per se. In 1875, an American songwriter named Henry Clay Work was visiting England. While there, he checked in to the George Hotel in North Yorkshire. In the hotel’s lobby was a large pendulum clock. The clock had stopped long ago and just sat in the lobby, serving no apparent purpose. This unmoving clock fascinated Work and he asked about its history. He was told a story by the proprietors, whether true or not (probably not) isn’t important to how grandfather clocks got their name. The story was that the clock had belonged to the inn’s previous two owners, the Jenkins brothers, both deceased. It seems the clock had kept perfect time during their lives, but when the first Jenkins brother died, the clock started becoming less accurate. After this, the story went that the clock stopped completely dead- to the minute and second Jenkins brother had died. Maybe because it was his job to wind it and nobody else wanted the task, you say? 😉 According to the story Work was told, it was actually because it broke. Despite the best efforts of a host of repairmen supposedly hired by the new owners of the inn, they couldn’t get the clock going again. Now, of course, what probably actually happened was the clock died and was prohibitively expensive to fix, but looked nice, so the new owners of the hotel came up with a great story for the clock to hide the fact that they maybe just didn’t want to pay to get it fixed nor have it hauled off. Whatever the case, the bemused Work thought it was a great story. Being a song writer, he then wrote a song about the incident. The song was called “My Grandfather’s Clock”, released in 1876. It was taller by half than the old man himself, Though it weighed not a pennyweight more. But it stopp’d short – never to go again – When the old man died. It stopp’d short – never to go again – When the old man died. And in childhood and manhood the clock seemed to know And to share both his grief and his joy. For it wasted no time, and had but one desire – At the close of each week to be wound. And we knew that his spirit was pluming for flight – That his hour of departure had come. The public went crazy over the song. “My Grandfather’s Clock” went on to sell over a million copies in sheet music, which was fairly unprecedented for the day (Work had previously set that precedent selling over a million copies of the song Marching Through Georgia, which is still commonly played by marching bands today). The previous term for “grandfather clock”, the rather un-catchy “longcase clock”, was dropped almost immediately by the public in favor of the new moniker for the clocks. 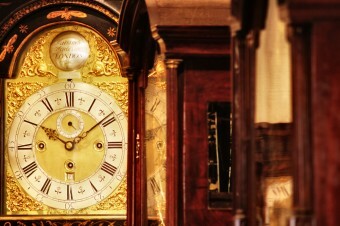 With the advent of digital technology and atomic clocks, some clock lovers worry that the old pendulum-swinging grandfather clocks may not be long for the current timekeeping world. However, despite its inanity, H.C. Work’s song lives on. It was recorded multiple times in the 20th century, and as recently as 2004 by the R & B act Boys II Men. It’s a song that, like grandfather clocks, keeps on ticking. Henry Clay Work wrote and composed a total of 75 songs, most of which sold well. The most popular of them, besides My Grandfather’s Clock and Marching Through Georgia, were: Kingdom Coming; Come Home, Father; Wake Nicodemus; and Thy Ship That Never Returned. Besides composing music, Work also was an abolitionist, as was his father. Work’s family home was a popular stop on the Underground Railroad, helping runaway slaves get to Canada. For this, Work’s father was imprisoned for several years. Work was inducted into the Songwriters Hall of Fame in 1970. Work’s cousin, Frances Work, was the great-grandmother of the late Princess Diana of Wales. 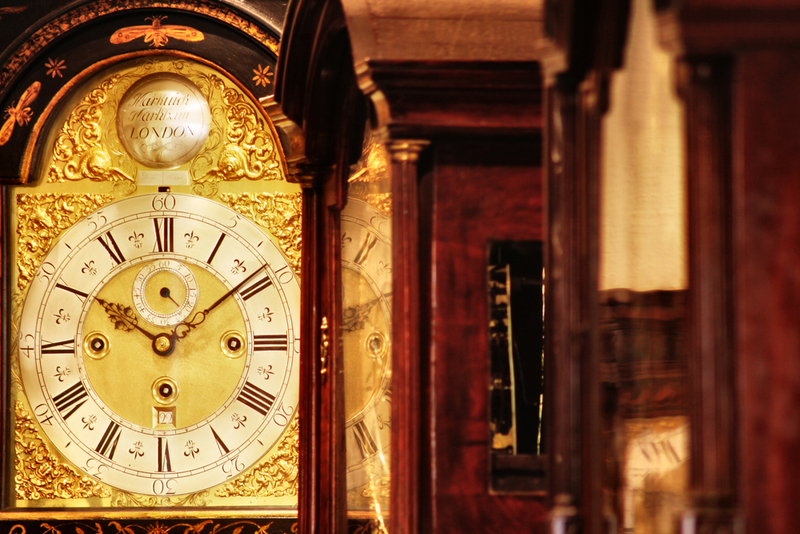 The first grandfather clock was created around 1680 by British clockmaker William Clement. These tall style clocks were made possible thanks to the anchor escapement system, which allowed for much smaller motion in the pendulum than used to be necessary. Before this system, pendulums in clocks needed 80-100° of swing. After this mechanism was invented in the 1670s, a swing of just 4°-6° was all that was needed. The advantage of the longer pendulum and shallower swing is that less power, in the form of weights driving the clock, was needed, as well as slower beats and less wear on the moving parts. All this makes for better long term accuracy of the clock. Grandfather clocks classically were made in 8 day and 30 hour varieties (lasting this length of time when wound up). Eight day clocks used two weights, one for the striking mechanism to cause a chime at the appropriate moment, and one for driving the clock. This would then typically require two winding holes (where you’d stick the winding “key” to wind the weights back up). 30 hour clocks were cheaper, using the same weight to power the clock and chimes, thus only needed one winding hole, but needed winding every day. However, because people often wanted to make other people think they owned a more expensive 8 day clock, some 30 hour clocks featured two holes, one for the actual winding hole, the other a dummy winding hole to make guests think it was an 8 day clock. An alternative design to the “key hole” system was to use a chain or cable driven system, so instead of winding the weight back up, you pull the chain to raise the weights back up to the top to power the clock. The melody that the vast majority of grandfather clocks use for their chimes is Westminster Quarters. This little tune is thought to have been borrowed/inspired by Handel’s Messiah during the 5th and 6th measures of “I Know That My Redeemer Liveth”. As to the person who first put this little ditty in a clock, Dr. Joseph Jowett was hired to make the tune, possibly with the help of Professor of Music, Dr. John Randall and/or one of Jowett’s students, William Crotch. Whatever the case, the piece of music was written in 1793 for the St. Mary the Great clock at the University Church in Cambridge. It was later adopted for the “Big Ben” clock at the Palace of Westminster, which is what spawned its widespread popularity. Might wanna check that up. I heard that song all the time on a kid’s recotd when I was a kid. I didn’t know the last two verses until today – guess they didn’t put the whole song on the record. Still a great somg from my childhood! Shouldn’t it be `their` name? “…Jenkins brother had died.” Jenkins’ brother, or Jenkins’s….it’s a possessive, so it requires the apostrophe or apostrophe and S.
Another amazing and interesting story! Thanks a bunch!